BEEF AS IT SHOULD BE. Our all-natural beef is completely grass fed and finished. We use no artificial coloring, additives or preservatives, and our cattle are never given hormones or antibiotics. We’ve worked hard to create meat that’s both healthy and delicious—the way it should be. MARBLING – Grass fed beef is healthier because of the CLA (conjugated linoleic acid), vitamins A, D, and E, and omega 3 to 6 ratios, in part related to the healthy fats within the muscle tissues. A grass fed animal that is too young, too small, or doesn’t grow fast enough in the finishing period, will not develop properly to provide these healthy benefits and will not have the taste you desire. We focus on the marbling for health, flavor, tenderness, and taste. GENETICS – Our beef comes from a line of La Grande Angus cows and Hereford bulls from South Dakota and Gardiner Angus bulls and cows from Kansas. With these genetics, our cattle are predisposed to produce tender, marbled meat. To ensure we produce a consistent product, we ultra-sounded and DNA tested our herd to verify they will produce beef that grades Choice by USDA standards. In the ultrasound image from one of our steers, the white snowy markings show the marbling in between the 12th and 13th ribs. This ultrasound indicates that the intramuscular fat exceeds 4%, meaning it will meet the USDA grade of Choice. If you would like to see more on how we ultrasound our cattle to produce high quality beef, click here. Marbling – Grass fed beef is healthier because of the CLA (conjugated linoleic acid), vitamins A, D, and E, and omega 3 to 6 ratios, in part related to the healthy fats within the muscle tissues. Genetics – Our beef comes from a line of La Grande Angus cows and Hereford bulls from South Dakota and Gardiner Angus bulls and cows from Kansas. AGE MATTERS – The age and size of a grass fed animal are extremely important factors when it comes to the development of the health benefits and taste. An animal that is under 20-24 months of age is too young and small, and will likely be lacking the health benefits you expect from your grass fed beef. THE FINISHING PERIOD – A grass fed animal needs a finishing period on a quality blend of annual grasses to properly develop the marbling for healthy fat and taste. To accomplish this, the animal must reach a certain weight in relation to their mother’s body weight, and gain a certain amount of pounds in the last period before processing. USDA INSPECTED FACILITY – We use a USDA inspected facility both to ensure humane treatment during processing and proper meat handling. CONSISTENT NUTRITION – In order to produce a consistent product, we must offer our cattle a consistent diet throughout the year—including through the periods of drought or extreme Texas heat. We use an irrigation system to maintain annual grasses planted throughout the year. Without a consistent availability of nutritious grasses, the animal might become stressed which could affect the quality of the beef. IT’S A SCIENCE – We’ve worked hard to develop a grass fed beef program that incorporates the best known finishing techniques. We’ve studied under Dr. Anibal Pordomingo from Argentina who works in a research facility and raises grass fed animals there. We also learned from Allen Nations, another expert on proper finishing techniques. 21-DAY DRY AGE – We dry age our meat for 21 days to breakdown the muscle and help make the meat tender. 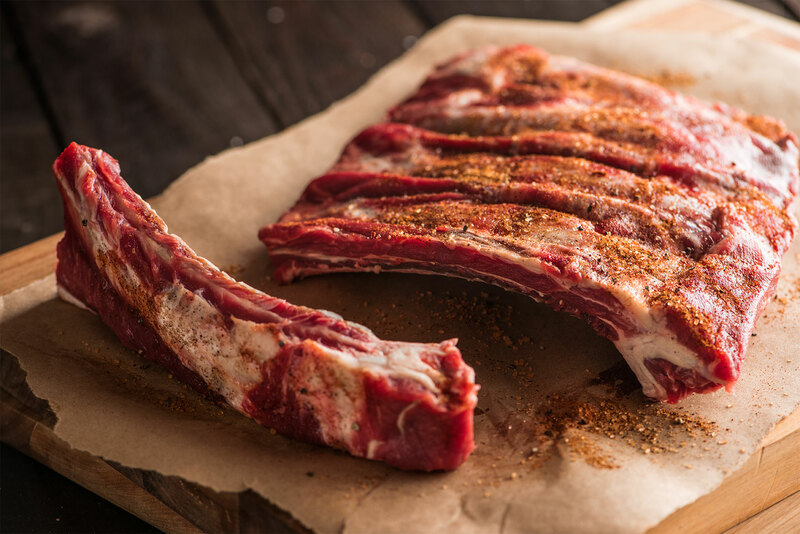 Superior Genetics + Proper Finishing Technique + The Right Environment + Happy Animals = Beef That Meets or Exceeds USDA Grade of Choice, and is Consistently Tender, Healthy, and Flavorful. While our cattle are always on grass, they require vitamins, minerals, and salt–just like we do. These supplements are offered to them “free choice,” so they can enjoy them at will while they are in the pasture. We also use an approved supplement called “cotton seed cake” which is made up as a custom blend for us from cotton seed meal and alfalfa as a tasty treat and roughage product to gather the cattle for periodic health checks and pasture rotations. This helps us avoid putting any undue stress on the animals through the use of cowboys or dogs to herd them. Grass fed beef without any additives, preservatives, artificial coloring, hormones, antibiotics, or other unnatural nonsense. Our beef meets or exceeds the USDA definition of choice. That’s rare in grass fed beef. If it doesn’t taste good, why eat it? Our beef is healthy without compromising flavor. Our ranch is just outside of Austin. For Central Texans, you can’t get more local than that. For everyone else, we still believe this is the best grass fed beef you’ll ever taste. Pay For The Meat You Get. You should only pay for the meat you get, and get a discount for the more you buy. Choose one of our boxes, build your own a la carte box, or buy the whole steer. Customize your experience and order.